A fine blend of high quality black teas, this English Breakfast tea provides a robust and flavorful experience that is sure to make your morning. Get a fresh start to your day with this exceptional tea. Receive an additional 5% off your entire purchase! Use Coupon: "TODAY" at Checkout. Fresh water is essential for brewing a proper cup of tea. Use 1 teabag per cup of boiling water. Remove tea bag and enjoy! 100% Money Back and Satisfaction Guarantee. NO questions asked! When it comes to tea tradition, it is impossible not to envision English Breakfast Tea. Our version of this iconic blend boasts black tea from Northern Thailand where the high elevation produces premier tea plants. In spite of its name, English Breakfast Tea can be enjoyed whenever a rich, flavorful tea is desired. This delightful tea finsihes with a malty, robust flavor, with slightly sweet undertones, and an enthusiastic body that takes well to added milk and sweetener. The strong, stimulating taste of a cup of English Breakfast Tea is not the only good point to this enlivening brew. 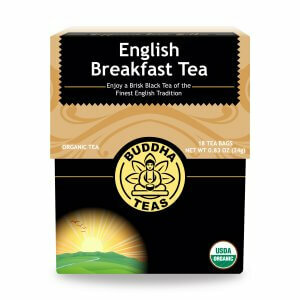 Like other black teas, English Breakfast Tea can be a source of vitamins, minerals, antioxidants, and more. Naturally, English Breakfast Tea can also provide antioxidants through its flavonoids and other constituents, and even offers amino acids, and the catechins. Whether you are a seasoned tea drinker or a newcomer to the tea tradition, our inviting, simple English Breakfast Tea impresses. Here at Buddha Teas, we employ only the freshest natural ingredients to create high quality teas that provide you with the very best qualities tea has to offer. We are committed to the health of both our customers and the planet, which is why our teas are packaged in bleach-free tea bags. As well, our boxes are made from 100% recycled, and recyclable material. 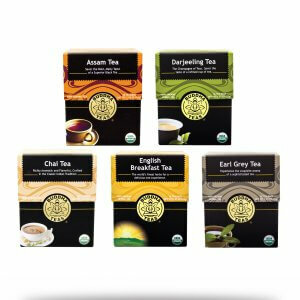 What sets us apart from other tea companies? 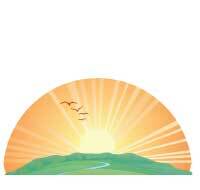 We start with a philosophy of living in harmony with nature, not using it for profit. Buddha Teas uses only fresh, pure organic or sustainably wild harvested ingredients and maintains their natural purity in every tea we sell. We have also created the "Teas for Trees" campaign, planting 5000 trees a year to offset the paper use in our tea bags. Each of our tea bags is bleach-free to eliminate the risk of chemicals, and our boxes are made from 100% recycled material. When you buy Buddha Teas, you'll enjoy the fresh, full flavor of a truly natural tea in every sip. Our “Tea for Trees” campaign creates a sustainable model that restores one of our most precious resources while offsetting the paper used in our products. We’ve partnered with The National Forest Foundation’s Trees for Us, a program that annually plants millions of trees throughout our national forests. By giving back whenever possible, Buddha Teas strives to honor the earth and its many blessings. Help us plant trees while enjoying an unadulterated tea that’s healthy for you, and our planet. Read more about it here. I really like this tea and the fact that the tea bags are not bleached. Only thing is, I can't seem to find this tea in any stores; I have to order online which means shipping cost! A solid English Breakfast Tea. Flavorful but no too strong. A good everyday choice. Will definitely purchase more! Review Title: A Bright Breakfast that's Organic! I've needed and wanted to find an organic English Breakfast tea that tasted great and was affordable and I've finally accomplished that with Buddha Teas. I'm a new fan and as a holistic nutritionist will be sharing the information. I have a Master in Science in Holistic Nutrition and can be rather critical of food and drink options. Sometimes it means it is hard to find clean but also good tasting and affordable options. My Buddha English Breakfast meets all my requirements and tastes great too! I look forward to my morning cup! I have been drinking black tea every morning for years and stumbled upon Buddha teas because they are organic with bleach free bags. Now I get all of my teas from them. This is a nice start to the morning. Mild black tea flavor is all I need, I drink tea for the benefits and enjoy mild distinct flavors. This is a very nice, satisfying one and is now a staple for me. This tea makes me want to go to England and only eat breakfast. Too weak for my liking, but I have mine English style, with milk, and I do like it STOUT. © Buddha Teas. All Rights Reserved.